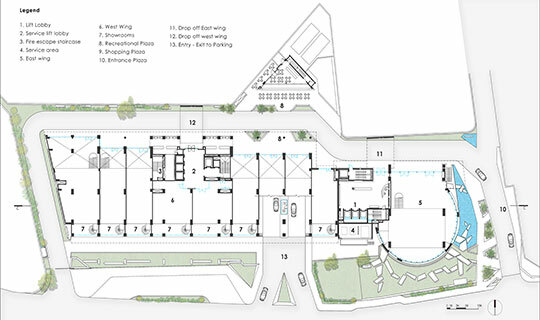 Plot Area : 7825 Sq mt./ 84227.6 Sq ft. 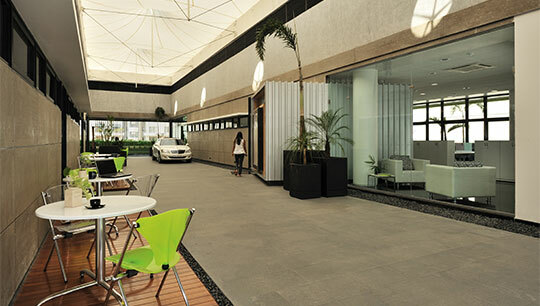 Built up Area : 25230 Sq mt./ 271573.46 Sq ft. 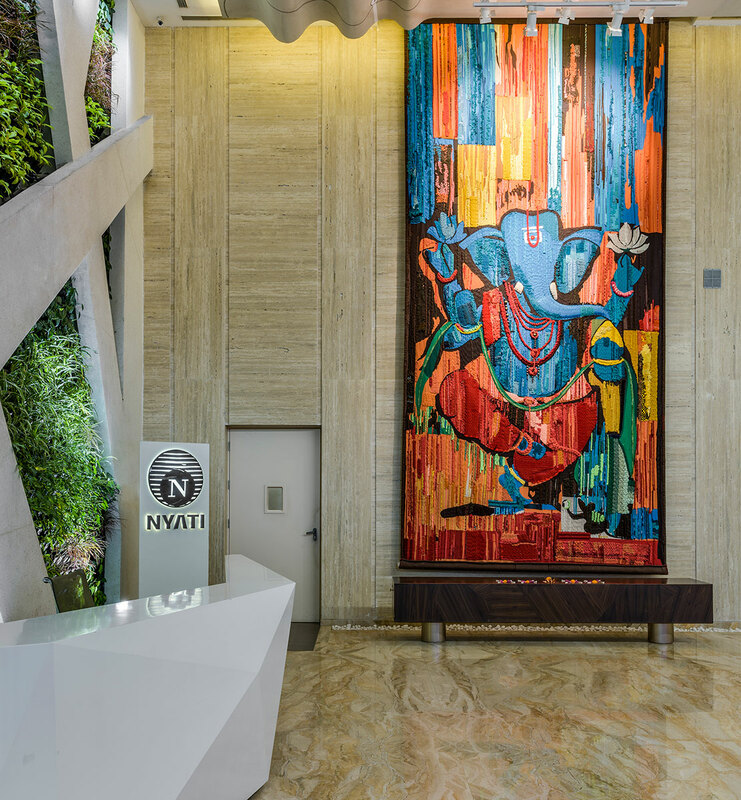 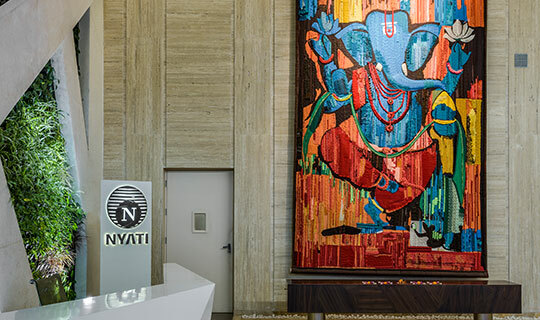 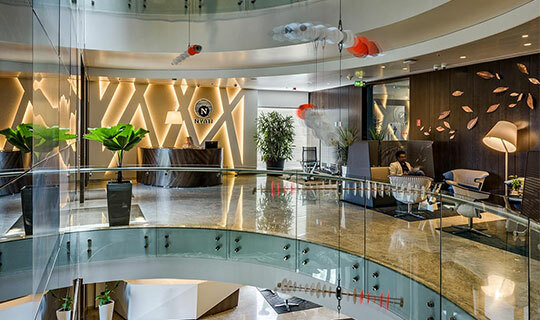 The Nyati Unitree is a progressive mixed-use development venture of the Nyati Group, a top real estate, construction and hospitality firm; located at Ahmednagar Road, Yerwada, Pune. 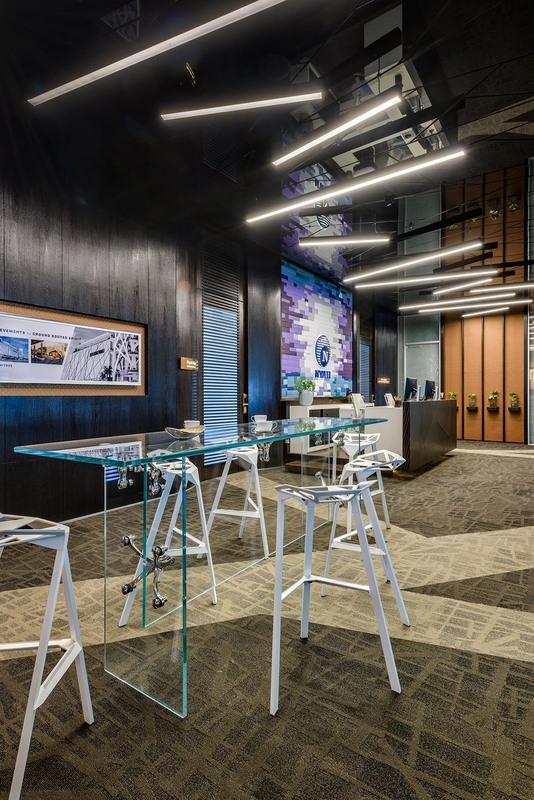 The project was envisioned as a sustainable, iconic, marketable real estate; expressing through its design, confidence and comfort; while establishing the client’s corporate identity as a modern, responsible steward for mixed-use development. 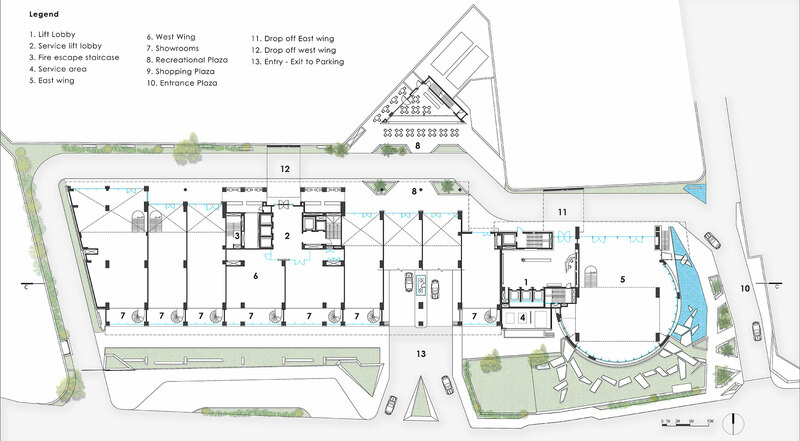 As per project brief, the building would house leasable modular offices & showrooms on lower floors, with the client’s corporate office accommodating a staff strength of over 200 on upper 4 floors. 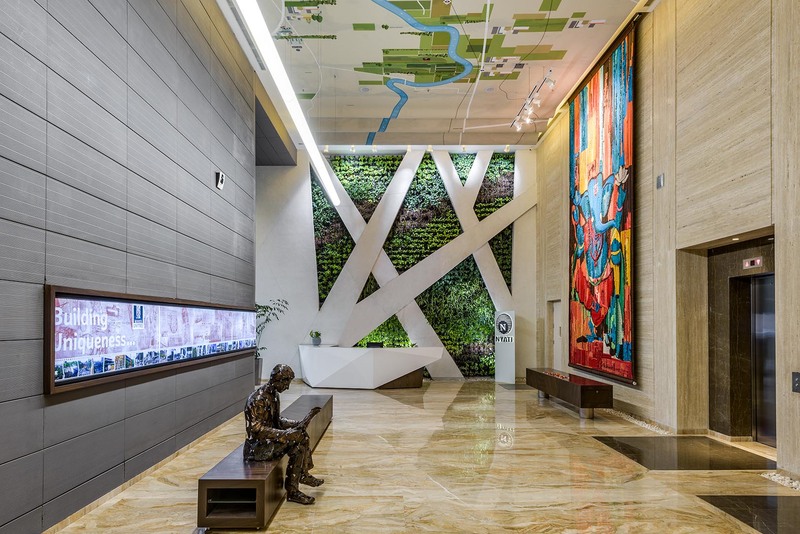 In addition, the design solution was to integrate green building technology for environment-conscious construction and maintenance, along with an impactful visitor experience, generated through a contemporary structure, free flowing interiors and a breathing façade envelope. 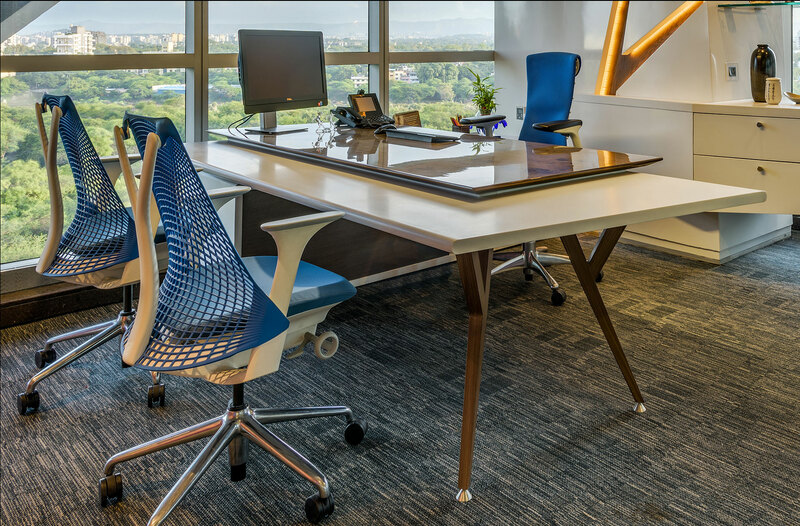 The design process started with extensive discussion and understanding of the client’s vision for their workspace, and a collaborative effort at establishing a set of design criteria. 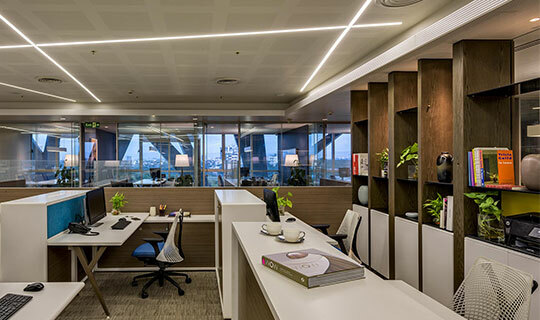 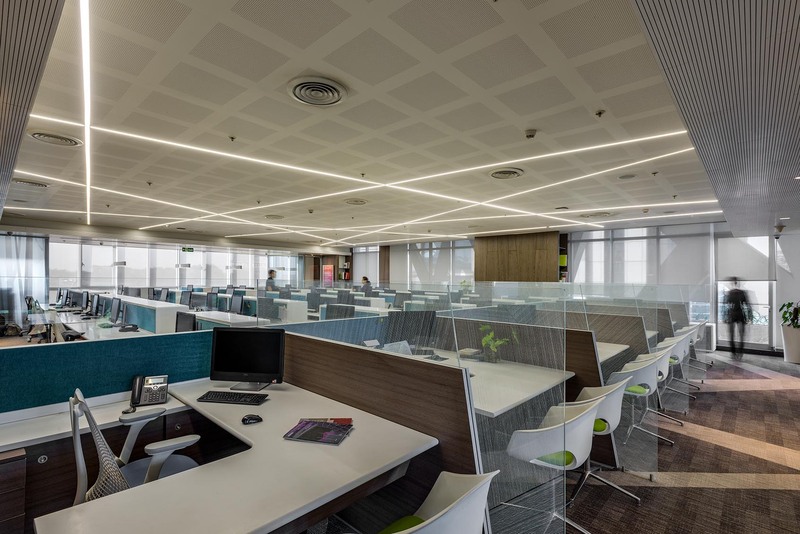 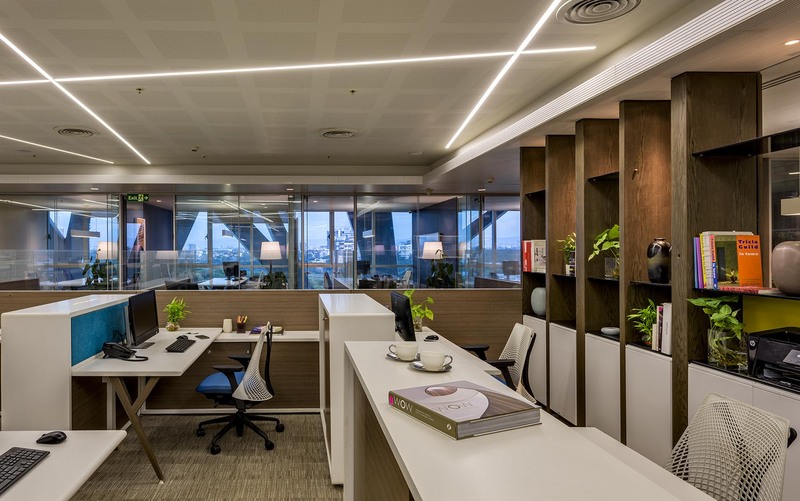 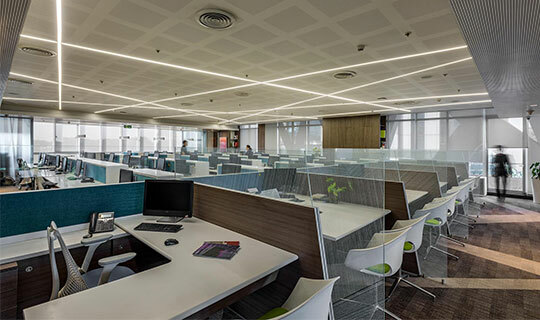 A value addition to the design brief involved setting up a contemporary work culture, ensuring a pleasant and energetic work environment for the 200+ ‘asset- squad’ of the company. 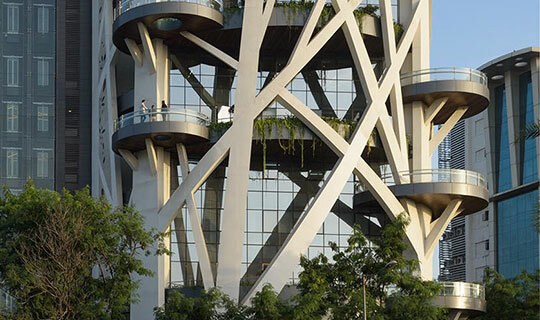 The design is composed of a pair of functionally distinct, yet interconnected buildings. 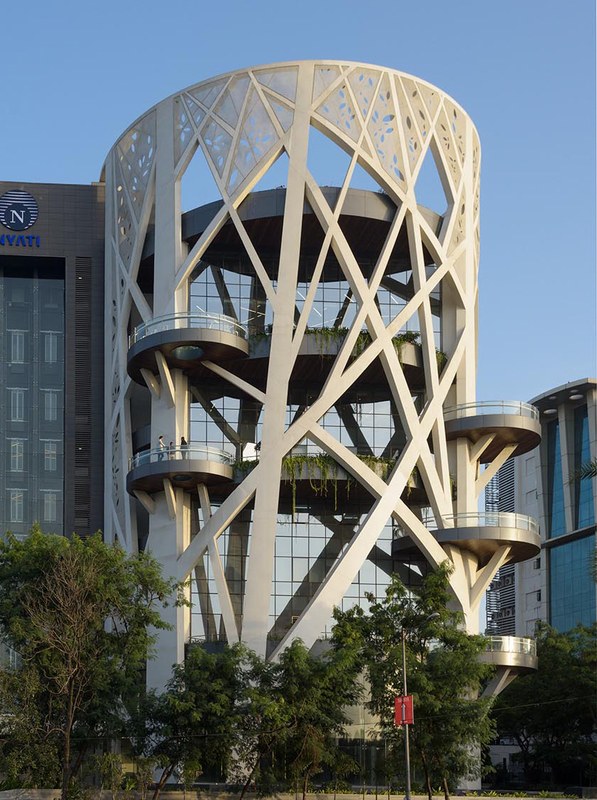 The corporate offices for Nyati Group lie in a cuboidal RCC structure with a glass façade, enclosed by a cylindrical perforated MS envelope. 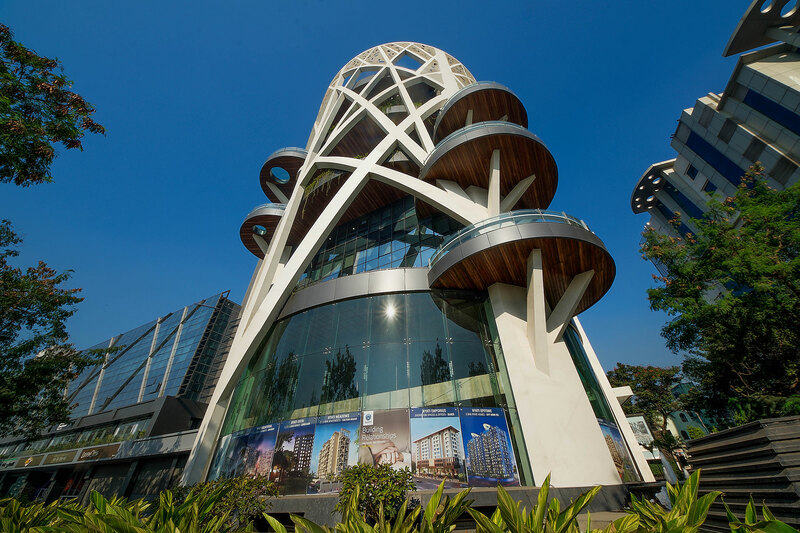 The commercial building is a horizontal glass façade structure, incorporating modular commercial offices and showroom space. 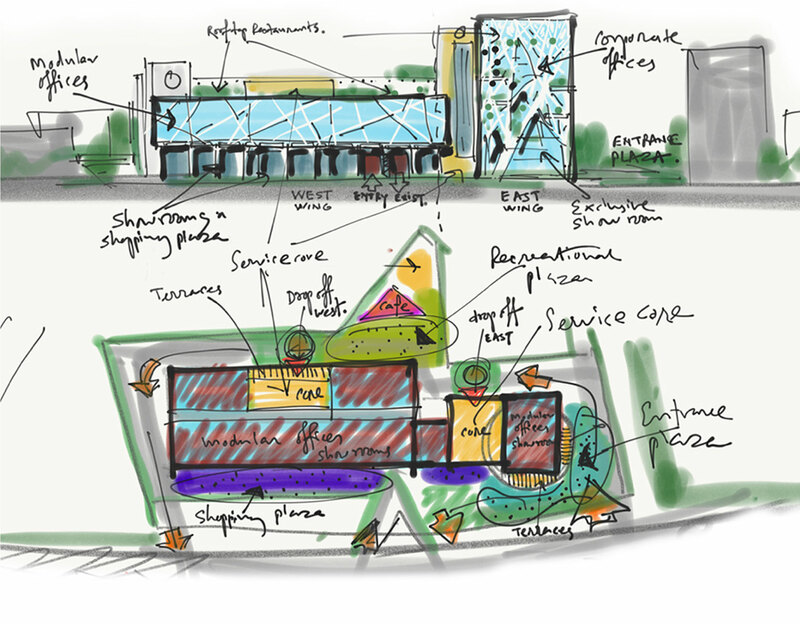 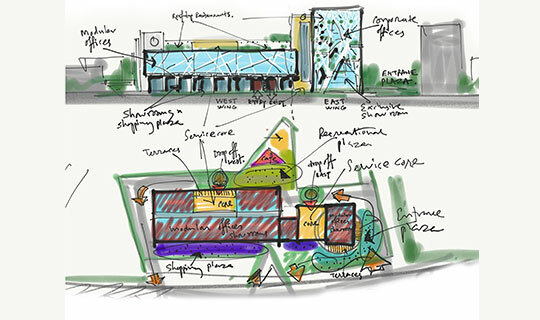 The planning of the ground floor ensures interconnection between the commercial and business wings, incorporating an entry plaza, a shopping plaza, showrooms and recreational zones, accessed by strategically segregated vehicular, user and visitor circulation patterns. 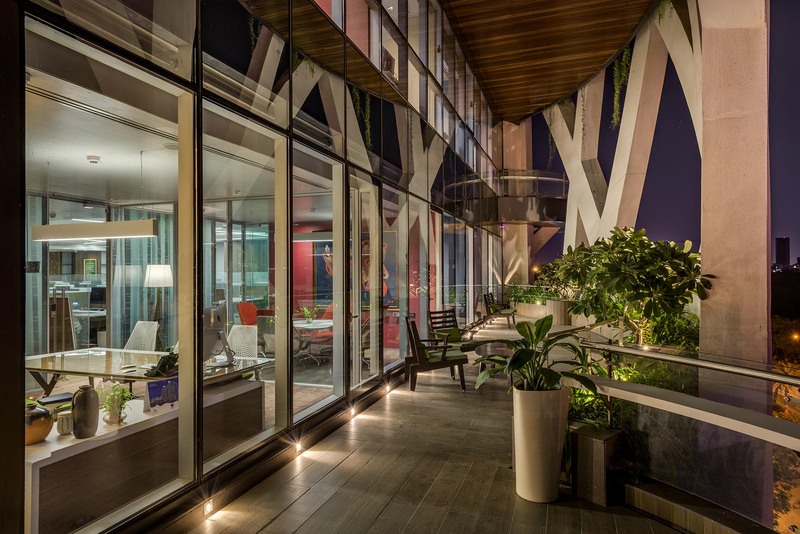 The building orientation exploits natural light while blocking thermal radiation through energy efficient double glazing on the North, South and East, with terracotta cladding for insulation on the West façade. 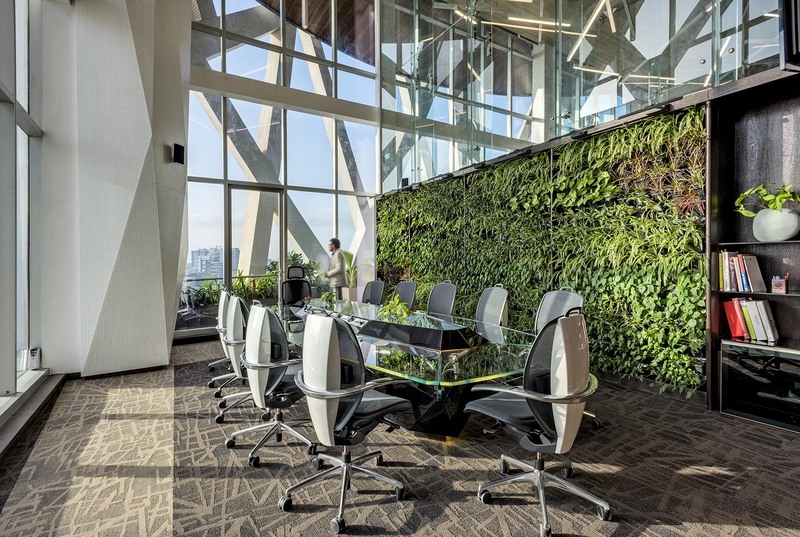 On the upper levels of the Corporate building, main work areas are supported by extending terraces, balconies, collaborative work zones and breathing green zones, to create a seamless fusion between indoor and outdoor spaces. 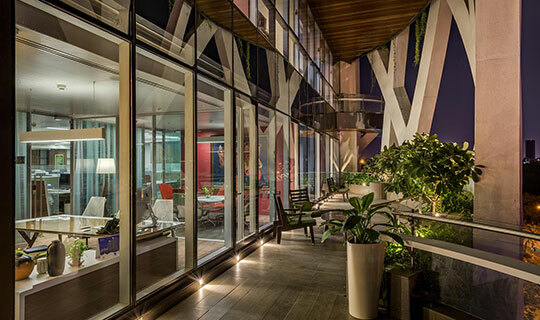 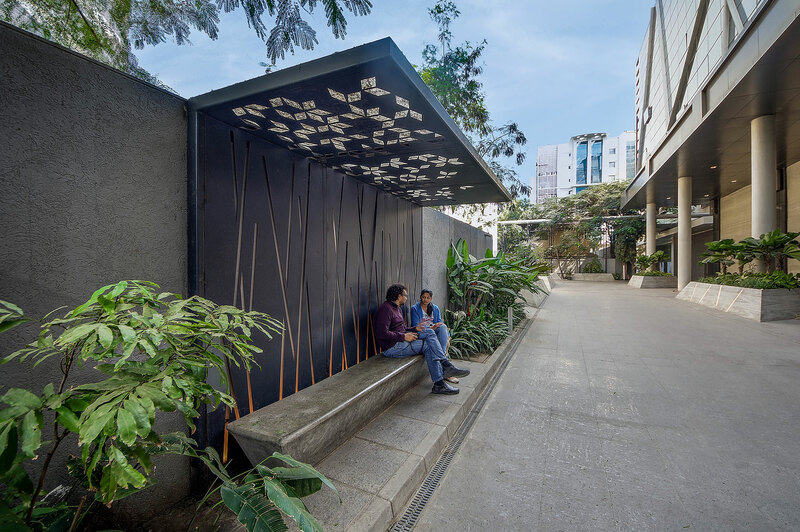 Terrace levels of both buildings are composed of rooftop restaurants covered by a branching canopy; together with green balconies and collaborative green spaces promoting a balance between work zones and breakout zones. 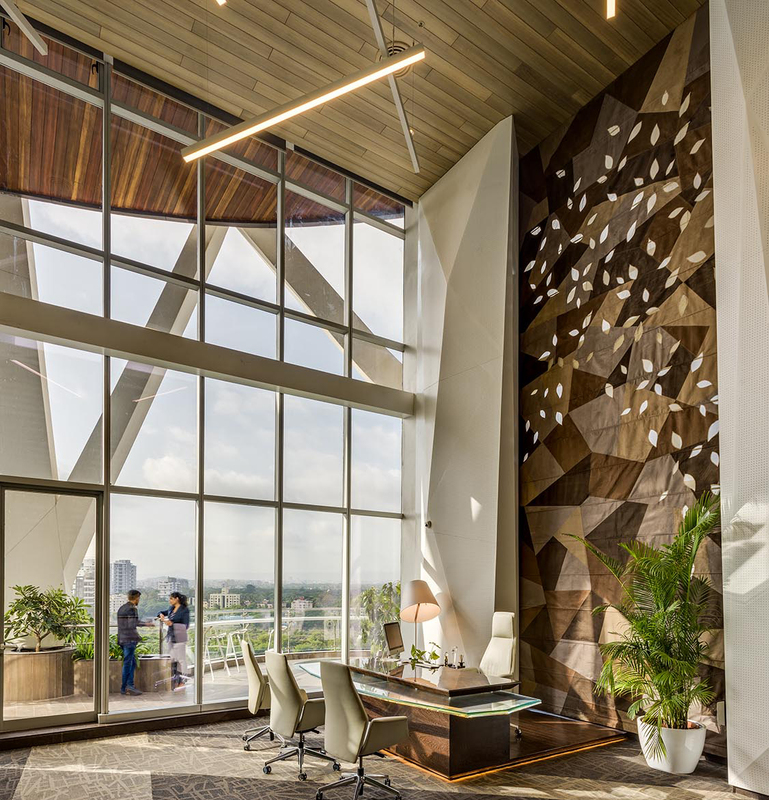 The visual consistency on the outside flows into the interior, reflecting angular branching elements in ceiling panels, wall cladding, lighting systems and art installations. 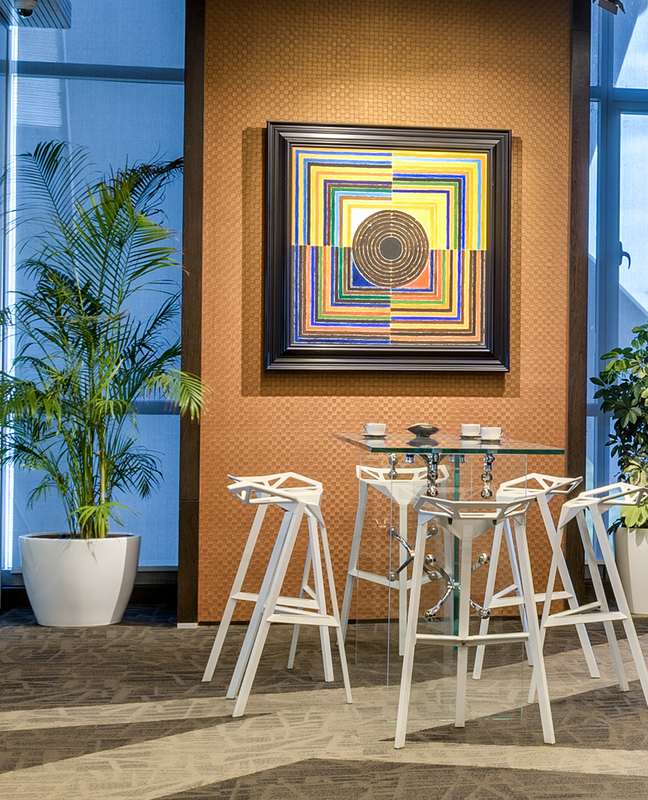 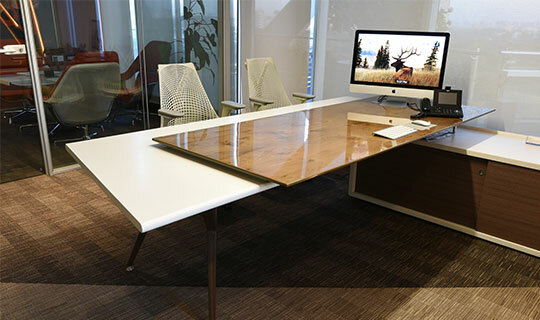 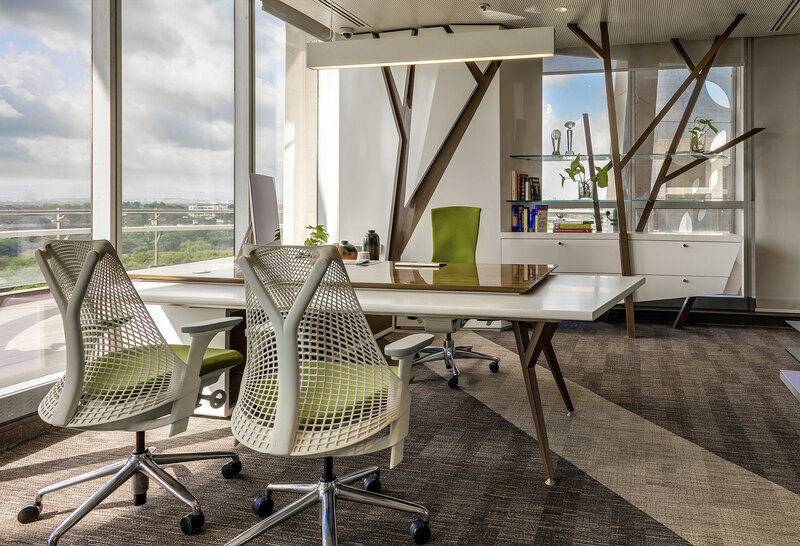 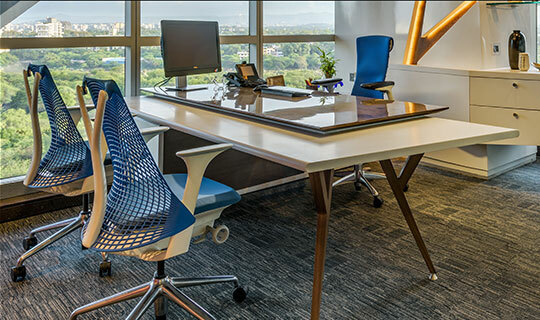 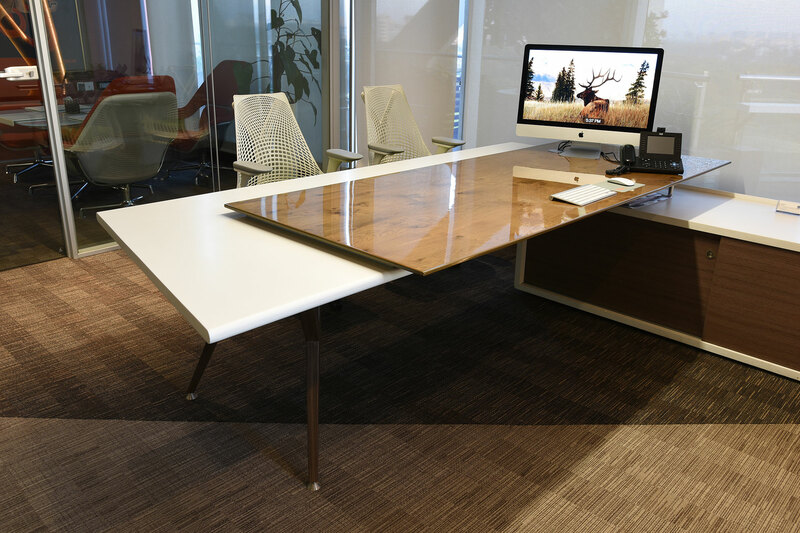 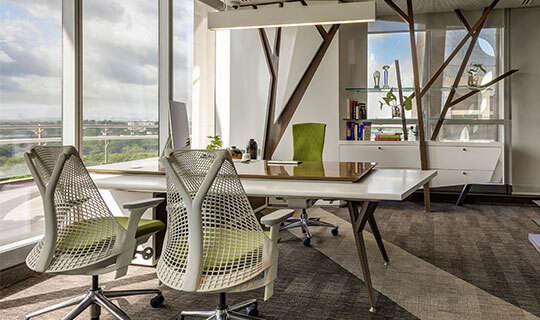 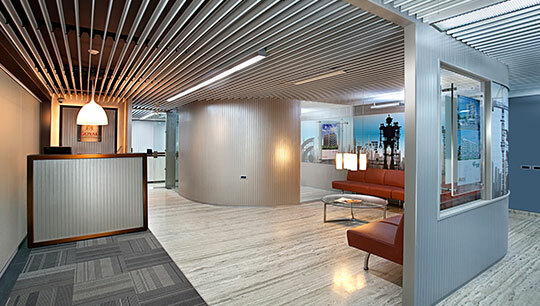 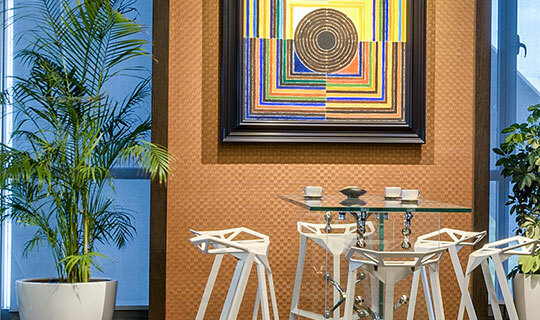 Rhythmic patterns add a dynamic energy to the work areas, while integrating the entire office into one unified entity. 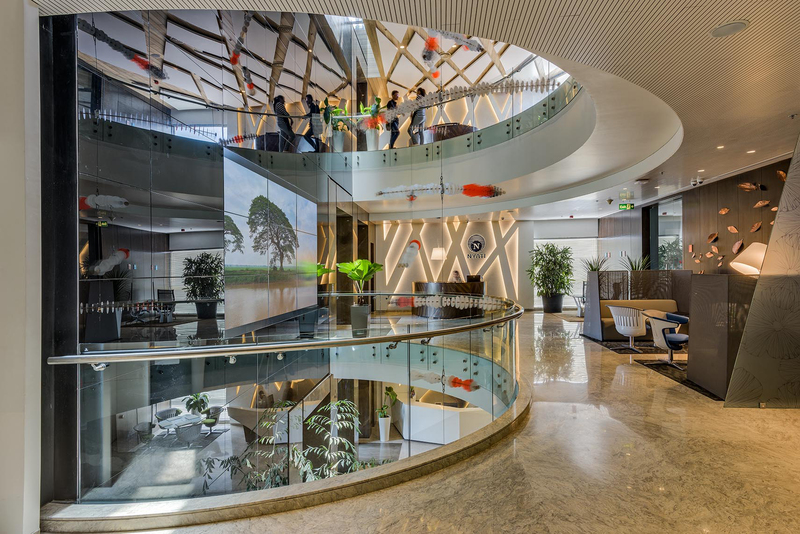 Angular branching forms employed in ceiling, wall panels, carpets and furniture, as a homogenous continuation of the of the ‘Unitree’ concept, set up a brand image and unify the aesthetic of the entire office; while infusing a dynamic energy flowing consistently throughout workspaces. 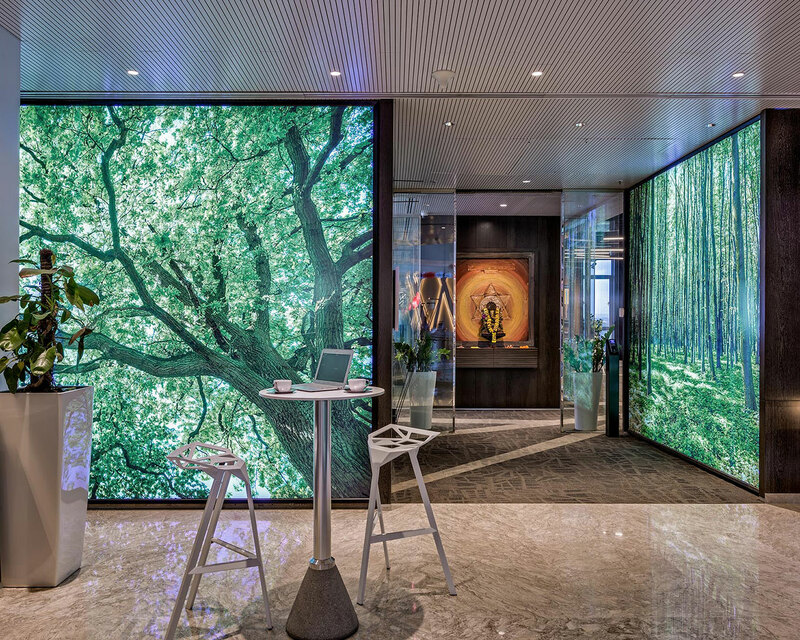 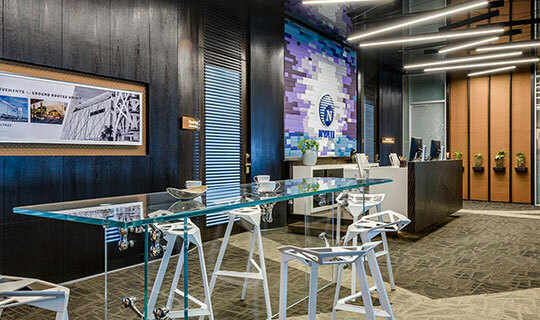 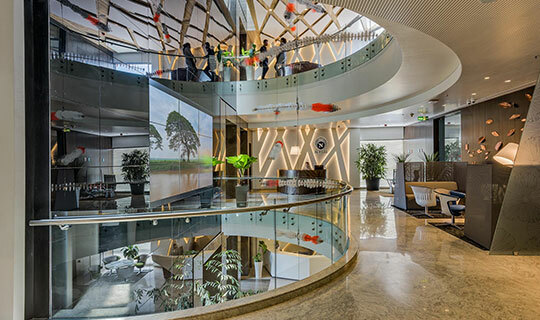 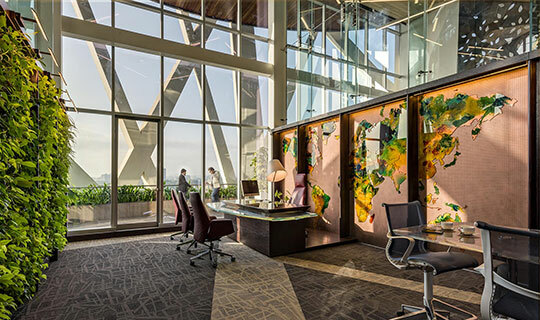 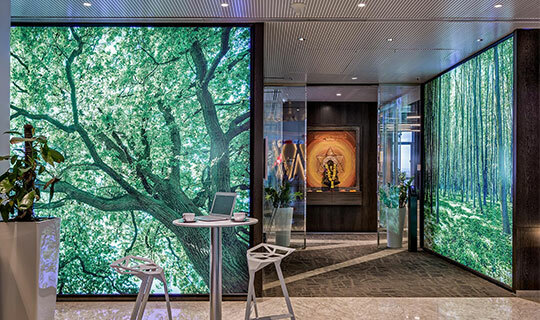 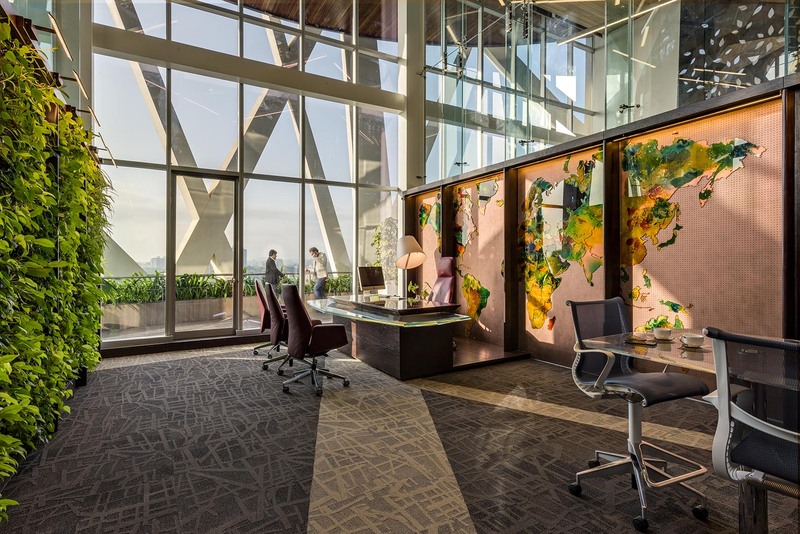 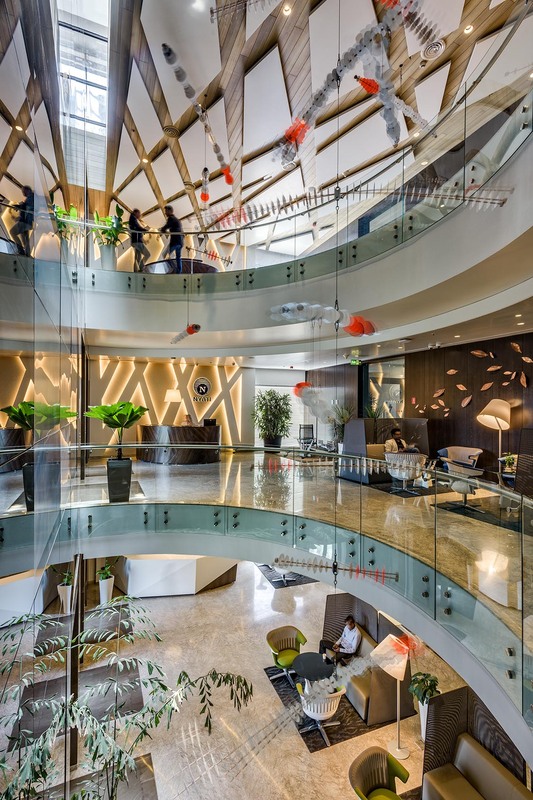 A central atrium has been carved out as a key feature to ensure visual connectivity among corporate floors. 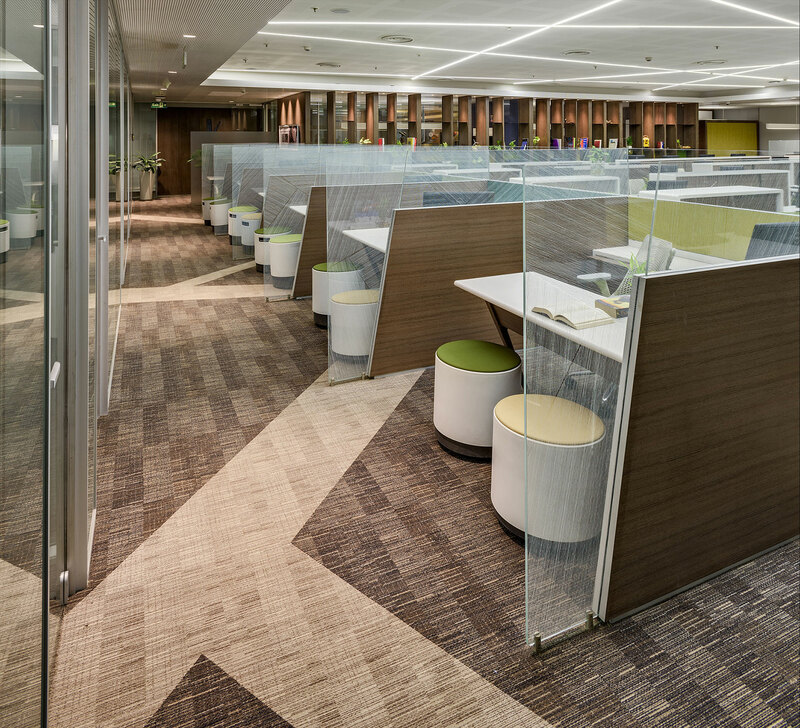 Circulation corridors are dotted with semi private and open collaborative workspaces, resulting in chance interaction and impromptu exchange. 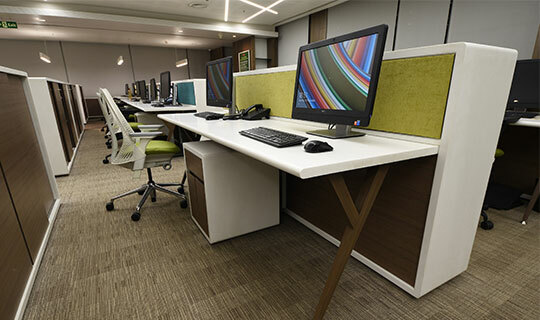 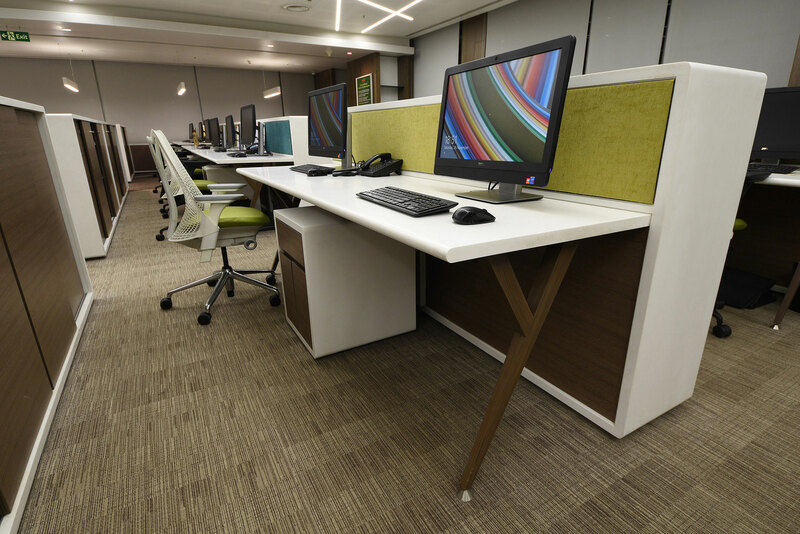 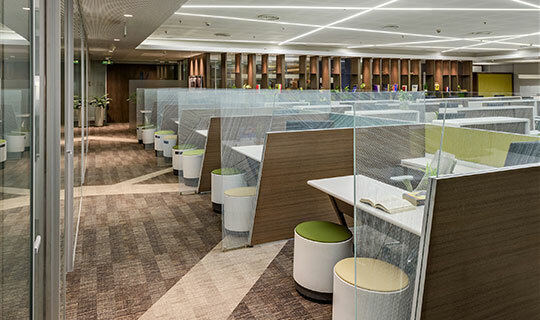 Custom designed workstations promote collaboration and teamwork through open planning. 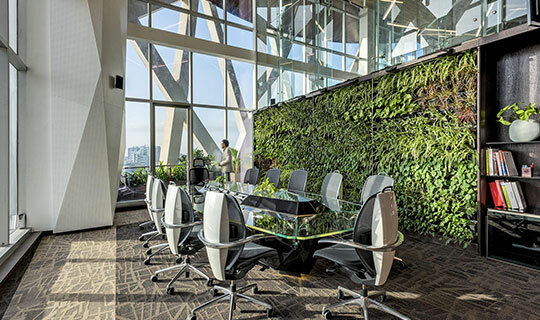 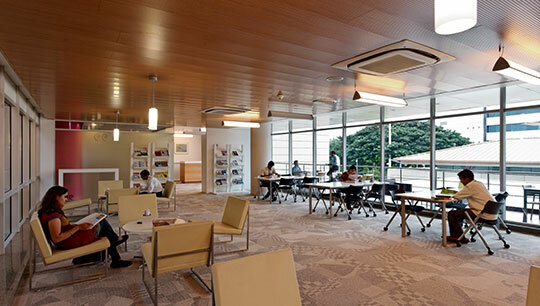 Weaving nature into interiors, the building attempts to unmechanize employees’ daily routines, providing them flexible, breathing spaces; optimizing their natural creativity and enhancing productivity; while raising levels of work-satisfaction. 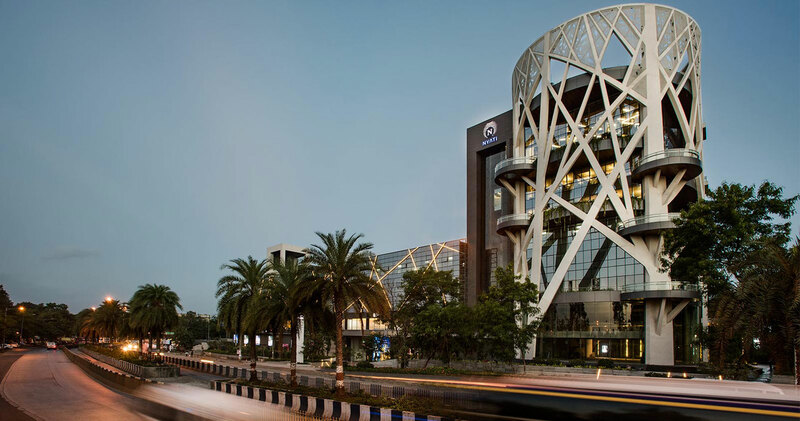 Environmentally responsible strategies were incorporated in the early stages of design; Pollution preventive construction & efficient waste management during execution, along with environment-conscious features and energy efficient design strategies, have helped the building obtain the prestigious LEED Platinum Certification, apart from being featured amongst top 50 shortlisted projects for Award for Excellence in Architecture by the IIA in 2016. 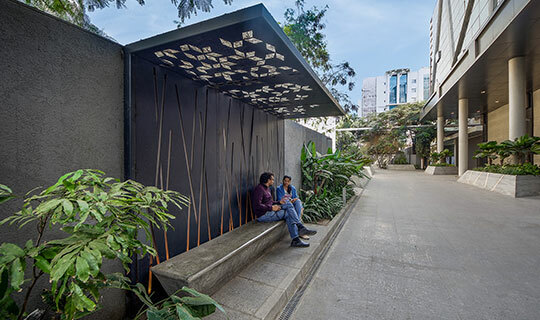 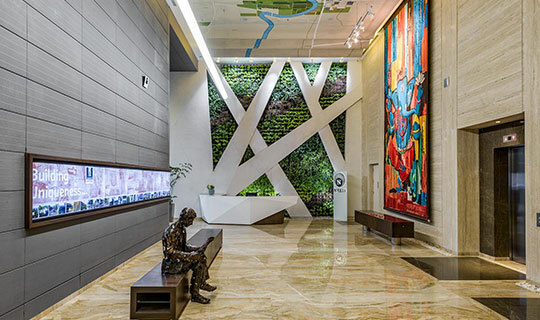 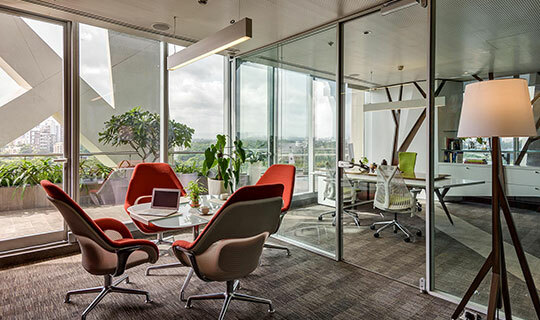 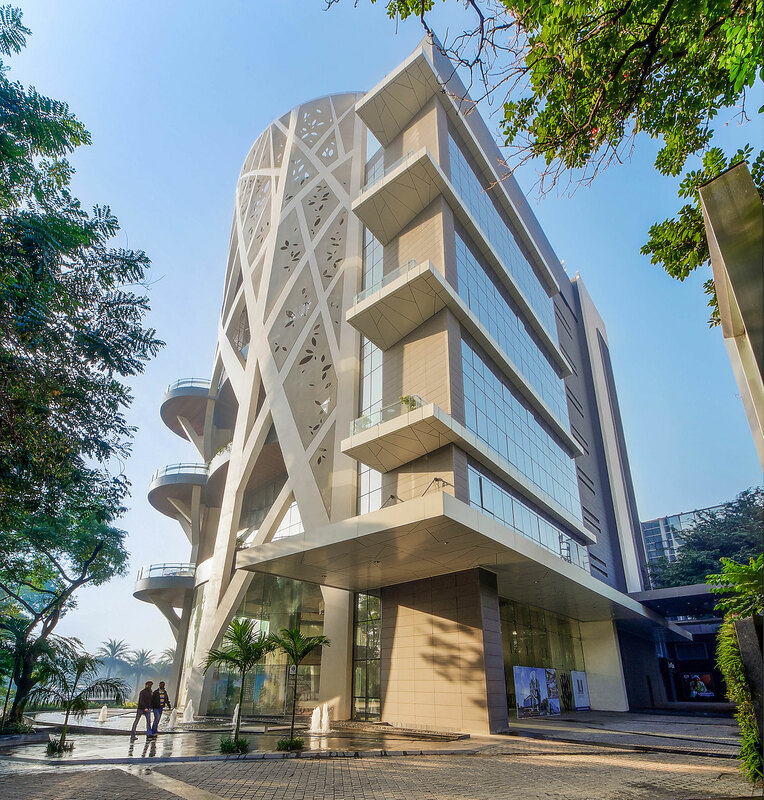 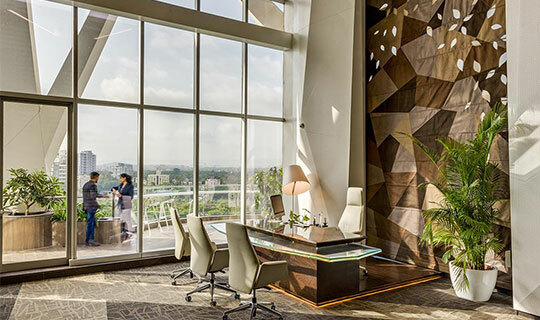 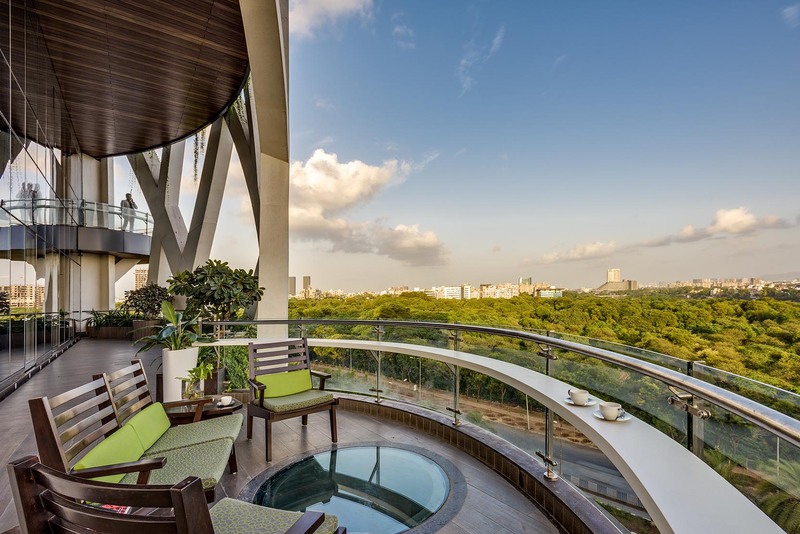 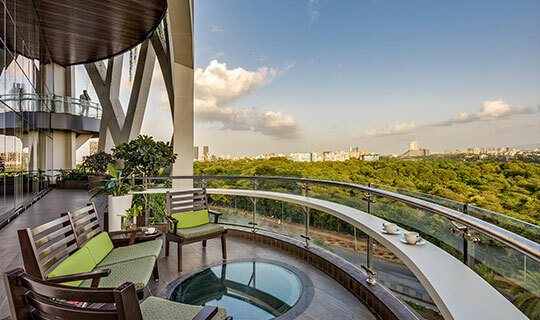 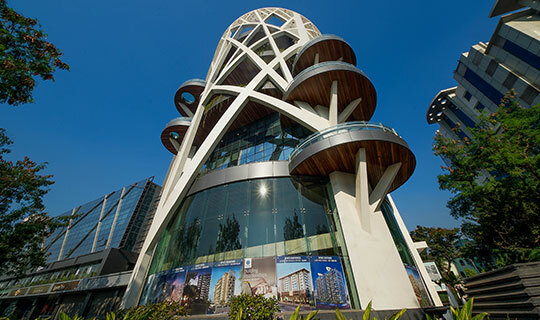 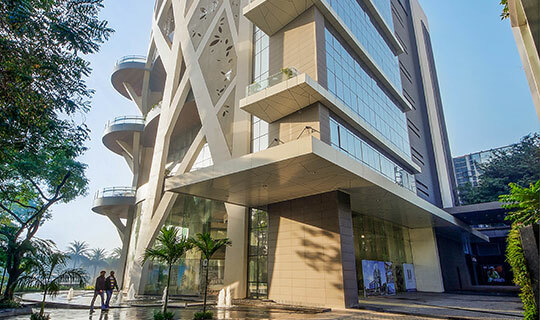 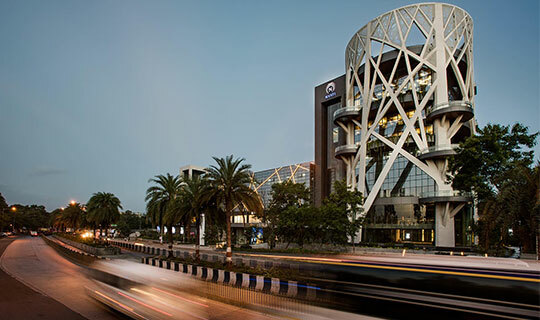 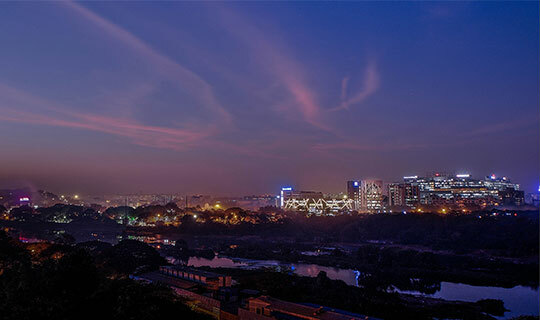 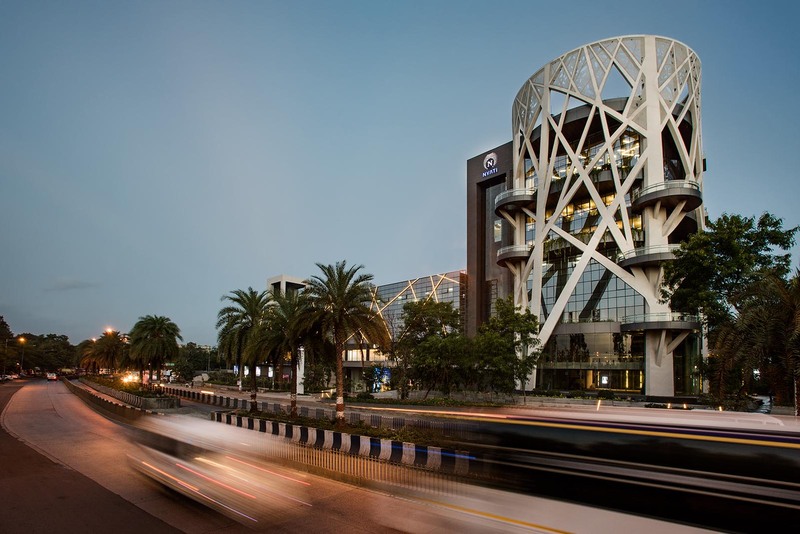 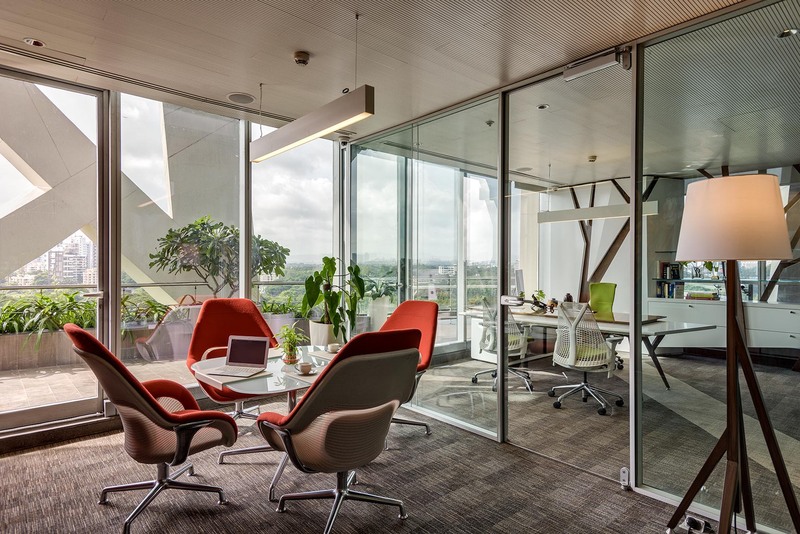 The project has also received the prestigious Asia Pacific Property Award 2018, for Best Office Architecture, India; as well as the AESA Beharey Rathi Award for Best Commercial Architecture, in addition to the AESA President’s Award 2018 for adding to the aesthetics of Pune city’s skyline; and the IIID Design Excellence National Award for Furniture Design, 2016.